One of my reader's sons was a recipient of Dengvaxia under the Department of Health (DoH)'s mass immunization program. A few days ago, the child started exhibiting some symptoms of severe dengue. Her son has no prior history of dengue. She emailed me, hoping that I can help her letter reach DoH Sec. Duque. I decided to publish the letter here in my blog, with very minimal edits on punctuation and choice of prepositions. Her English is far from perfect, but she writes straight from a mother's heart. I am one of the parents whose children received the dengvaxia vaccine. I am saddened with the news on the side effects of the vaccine. I now fear for the life and well being of my son. As a single parent with no stable income, I have no capacity to send my children to a private school and public school is the only option. More so, I cannot afford for any hospitalization. I am in such a hand-to-mouth existence that I wasn’t able to even pay/update my Philhealth contributions. 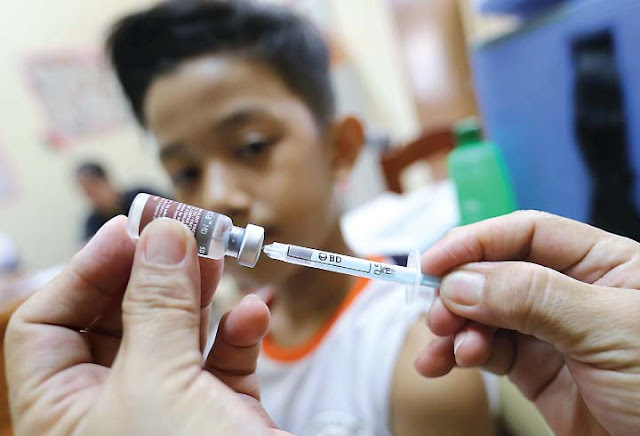 So when the government –DOH thru DepEd launched a program of vaccines for dengue, I was happy because I believed that my children can now be safe from dengue, safe from any eventual hospitalization due to the dengue virus (sickness). I fully trusted the government, that the DOH and all the people in charge of this program have sound judgment and are 100% sure that the vaccine is 100% safe, not harmful and only useful to the Filipino citizens especially to children. I cannot believe until now that our government can use our children to become guinea pigs. Until this very hour I cannot contain my fear for the life of my child. On Nov. 14, 2017 my son K**** A**** had fever accompanied with terrible headache, diarrhea and vomiting. I only self medicate since I don’t have money to bring him to the doctor. On the 3rd day he no longer have fever and the diarrhea has stopped so on the fourth day I already sent him to school. But on the following week that’s November 22,2017 he again had fever. He doesn’t want to move because he had a terrible headache, muscle and joint pains, pain in his nape and in his eyeballs. He also have diarrhea and vomit everytime he eats or drink. Again I only self medicate because of financial constraint. I only give him biogesic, papaya sap and oresol. On November 25, 2017. he had convulsions and he was already dehydrated. I gave dolan suppository and gave him pocari sweats and buko juice. That’s when I was able to borrow money and finally bring him to a doctor for consultation and did laboratory tests. The result shows that his platelet is already high but he already has infections in his urine and and his white blood count is also high. He was given co-amoxiclav. The following day, his fever already subside. And because I have no money I wasn’t able to bring him to the hospital but all the symptoms of dengue manifested in him. It's been four days since I heard the news about the vaccine and it’s dangers and I couldn’t sleep until now, thinking how dangerous the situation my son faces. And I cannot forgive myself if something bad happens to him. I already have this trauma. And I wanted to know and have him checked through blood test if indeed he just had dengue so I can monitor my child closely. I cannot have peace of mind until the test is done but I cannot afford it on my own. I have watched Sec Harry Roque's press conference with Dr. Lyndon Lee Suy on Dengvaxia and I am so frustrated, disappointed and I felt betrayed. I cannot believe how the government downplayed the dengue issue. I cannot believe how Sec. Roque, being the mouthpiece of the president, could make pronouncements that are not factual. His ignorance to the subject ( dengue sickness) is not an excuse for him to make statements that is contrary to the real effect or real condition having a severe dengue. He should not let the public go blind on a real condition with a severe dengue. On the contrary, he should have at least educated the people especially the parents of recipients of that vaccine so we could assist our children carefully. I have followed posts on FB pages of several doctors for a week now and I learned a lot from them. Their posts are very informative and they explained it in laymans terms, so that any parent could easily understand how the dengue works in the body, how it could affect the other vital organs and how it can endanger the patient. Doctors like Dr Richard Mata, Dr Willie Ong and others. I am disappointed at how the government downplayed the issue. the harm, the danger the physical and emotional issues we parents are battling now. I have come to ask myself: where can we go and ask help? Who would help us if the government is very reluctant. How can we seek justice? Then it came to my mind: where else would we asked help but to the very agency who caused danger to our children? It is this agency's negligence that the lives our children is now at risk, their safety uncertain. Therefore I now ask the DoH thru you Sir to please help us in every way. This is the least that this government/Dept (DOH) can do for us. I for myself am asking for blood test for my child so I may know if he just got infected with dengue or not. And I need a written assurance from DOH that the it will shoulder all medical , laboratory fees , hospital bills from the onset of fever…meaning from monitoring to actual confinement to all/any hospital may it be public or private whichever is nearer when time/need arises. Please stop asking us to go to public hospitals if it is too far from our residence because some of us if not most don’t even have money for transportation. And we have to really consider the distance as it could affect a lot to the well being of the patient and to the guardian as well. I am also awaiting some measures from the government such as maybe giving insect repellents to the 10% of the recipients in which the DOH spokesperson claimed who has not infected with dengue prior to immunizations. Or maybe the government will again conduct the brgy “smoke something” to eradicate mosquitoes. Or anything that could help these 10% free from dengue . I am sure this measures is not as expensive as the cost of the vaccines itself. I also understand that this problem is not caused by the present administration but still it is the government who made it happened or bring this great danger to the lives of the children. So please let us for now just simply think And consider the welfare, the lives of the recipients. Although in my innermost self I wanted all the people behind it, Aquino, Garin and the rest to be jailed but what truly matters now is the life of my son. And the assistance I am now seeking. I am hoping that you, your office the DOH will hear my plea and act on my request at the soonest possible time.